If you scroll through Twitter or Instagram (or any social media site really), you’ll see lots of posts with #girlboss attached. If you Google #girlboss, there are over 1 million hits, including an entire website dedicated to providing inspiration for ambitious women. I’m down with that! I’m happy to see women stepping into their power, striving for more and supporting one another during the process. And yet, when Aarti Sequeira shared her frustration about this phrase on Instagram a couple of weeks ago, I had a visceral reaction. It seems these days that everyone and their mother (literally) has a side hustle. Sales director by day, wedding planner by night. Kindergarten teacher by day, cake decorator by night. I can’t judge…I’m currently doing the same thing 😉 Social media becomes a hamster wheel until you run yourself into the comparison ground. So, here we are, running so fast to keep up with our fellow #girlbosses that we’re exhausted, depleted and serving absolutely no one. If you’re find yourself feeling this way, here are three questions to realign your priorities. Where are your expectations coming from? Who says you have to do all the things all of the time and share them all with your social media followers? You are allowed to take a break or have an off day. For me, someone who is an extrovert, having off days is especially hard because people notice and think I need fixing. In reality, I need wine, Grey’s Anatomy or sleep (other options possible too). For each project or area of your life, ask yourself, how is this serving you? Not how it’s serving your brand or your business but how it is serving you the person? Start by visualizing what lights you up during the day and really feel it in your body. What do you dread? What can you eliminate or delegate? Set specific intentions for each project and reevaluate them as often as you need to. Get granular on your timeline. How long will you dedicate to each project? Are certain projects a means to an end, meaning do you need to upskill for your new job so you’re ahead of the curve? This is YOUR timeline that you create on YOUR terms. It’s not meant to be a check the box exercise or to self inflict pressure. It’s to help you move forward on your goals. I’m here for the #girlboss as long as there’s intention behind wearing the label. Carry on my side hustlers, influencers, rockstars, moms trying to get through the day, superwomen, #girlbosses and don’t lose sight of your why. That quote summarizes my life. I am part of this amazingly powerful, courageously vulnerable and overall badass group of women. Women from all walks of my life, who look, sound and feel differently than I do. Some are right here in Philly and some are across the country. Regardless of distance, they’re my go to at anytime even when it’s not convenient, ever-growing tribe. There are many days when I sit back and admire this fierce lady tribe of mine. Members of the group have actually caught me staring at them smiling. Creepy, I know, but I’m not apologizing. I’m often in awe of how exceptional these women are and that ALL of them are in my corner. How in the world could I be this blessed?! Note: I have some great men in my life too; that’s another post for another time. For as long as I can remember, I’ve been surrounded by a village. A village of strong, kind, brave, fun women. My mother created this village and filled it with other positive role models: Her mom (my grandmother), her sister (my godmother), various cousins and her best friends. I was the first born for my mom and her friends. I became their doll, perhaps their practice baby and that place of distinction hasn’t changed almost 30 years later. These women, mom included, set the standard for how I view friendship. They have, time and time again, shown up for each other, to celebrate, to grieve, to support. It is unconditional love at its best. My mom monitored this village as I grew up. The older I got, the less control she had. Yet, she encouraged its growth, stating “you can never have too many people who love you.” That stuck. Fast forward to present day, here I am with my extraordinary girl gang because my mom cultivated this love abundance mindset in me. She is grateful I have other women in my life to look out for me, take me to dinner or listen to me. Yes mom, you’re always #1, they know that too. One of the tribe members leaned over my cubicle the other day and said “Everyone deserves someone who looks out for them the way you look out for me.” It’s like she knew I was writing this post (she didn’t). That my friends is what cultivating your own group of superwomen is about. I can’t give you a set of bullets to explain how these women walked into my life. I can say that there’s no perfect picture of who should be in your circle. Toss out any preconceived notions and stay open. Love is a limitless emotion and the circle that surrounds you can never be too big. I am forever grateful to my mom for making sure I was surrounded and to all the women who are walking with me on this journey. Check out my Instagram (@alexcharlic) to see and hear about some of these amazing women throughout the month of March. Recently, I’ve had conversations with people around my age about regret. Maybe it wasn’t labeled as regret per say, but that what if feeling that if something or someone were different, life would be easier/more complete/pick your positive adjective. For a long time, I wished the same, that things had been done differently. I wished for situations and people to change. After careful reflection, I’ve found that all those shoulda, coulda, wouldas got me here, where I’m destined to me. Every mile mattered. I wish you could have read these words long ago. They probably would have saved you a dairy or two. I’d like you to have read this around 14 or 15 when you thought your life was defined by other people. I’m here to tell you it’s not. It’s all yours. True you have a few more years under the parenting trios’ reign, but they’re not so bad. Sweet girl, this world is yours. There’s soooo much out there for you to explore. Don’t let your insecurities about your body or your brain stop you. You won’t be everyone’s cup of tea and that is ok. There is a tribe of exceptional women of all ages waiting for you. They’ll hold space for you, they’ll cheer you on, they’ll commiserate and drink wine with you. Don’t hesitate for a second on finding them. You are worthy of all this love. You are wise beyond your years. Don’t let that stop you from having some fun now and again. It’s a balance my love and if it doesn’t make you light up inside, move on. Boundaries will be important during the next decade. Don’t ever forget where and who you came from. They love you more than life itself. Cherish those small moments filled with dance parties and Saturday ice cream dates. Those will get you through the drama and pain that all families have. You can be both beautiful and strong, independent and in love. You chose the how to define yourself. Every scar, every sad AIM away message, every step in this journey, they each matter and you my dear girl matter so much. I’m surrounding you with all of the hopes and dreams in the world. Since we’re mid-way[!] through the first month of 2019, it’s time to put my intentions for the year out into the universe. As I shared last year, I prefer intentions over resolutions as the new year begins. Last year, my words were ease, kindness and ownership. I feel like I did a relatively good job living by these words. I definitely learned to flow more with the universe, down to the mundane daily tasks that sometimes shift. Kindness when annoyed or stressed is for sure harder. I’m learning to focus on the positive and embed more random acts of kindness, like holding the door, into each day. Ownership was likely the hardest; I still react when triggered but I’m better at articulating what I’m feeling and why I was triggered. Connection: I’m all about building relationships and connecting people so at the surface, this seems fairly simple. I am challenging myself to meaningfully connect with people who are different from me or who I have a strained relationship with. It’s harder to be present with someone who challenges you. Conviction: This might look similar to ownership, which was all about owning up to my big emotions. Conviction is about values and purpose – knowing who I am, what I stand for and holding true to that even when challenged. There’s that word again…challenged. Calmness: I’m noticing more and more that I need crave quiet reflection time. Stillness brings peace and a settled feeling. I plan to embed calmness and silence into my nightly routine and blocked time on my calendar each Sunday for reflection time. There’s something empowering about sharing my intentions with the world. Even writing them in your journal can help. My super talented friend Lizzy Russinko creates beautiful prints with people’s words of the year. While you can no longer submit words to her, perhaps yours is included in this year’s print. If not, I encourage you to share your intention for 2019. It can be words, a phrase or even a specific color. Having something to guide your year gives you momentum. Please fill up the comments with your 2019 intentions too! As a kid, Christmas was always a big deal. In fact, everything was a big deal. A good report card, a promotion, birthdays, we celebrated it all. This celebratory style I grew up with followed me into adulthood. As I’ve gotten older, buying Christmas gifts has become one of my favorite pastimes. It’s a fun feeling of both excitement and joy, when a loved one unveils the perfectly curated gift. Yet, finding the perfect gift for my parents and grandparents always feels like mission impossible. What do you buy for the people who have everything?! Year after year, I’d struggle with Christmas gifts and try so hard to keep up with my parents, who are supreme gift givers. This year, I rethought my approach. My parents could care less what they opened on Christmas morning. Sure, I asked them and ended up with one bigger gift that was actually something they needed. They want things that money can’t buy – all of their kids in the same place, to cook together and for us kids to spend time with our grandparents. Looking back on this holiday season, that’s exactly what I gave, time. Each year as I stepped further into adulthood, I tried to conjure up ways to give back what my parents gave to me. At the end of 2018, I can say I’ve stopped trying. There’s no way in the world that I could repay them for all they’ve given me. And are still giving as I sit on the beach in Florida at my mom’s house while my dad and stepmom diligently wait for the call to pick up my car for me. As they say, a parent’s work is never done. Don’t overthink it, my fellow 20’s somethings, who I’m sure are navigating this much like I am. Talk to your parents, grandparents, everyone in your life so you can co-create these memories together. They will sustain you during the longer, harder stretches of your life. Did you know that humans are the only mammals that don’t follow their guts? We often ignore that feeling deep in the pit of our stomach or the words choking us, paralyzed in the back of our throat. How many times have you reread a text or email message before hitting send? *Raises hand slowly. * Don’t worry, you’re not alone my friend. Since March (and probably before then), I’ve been on a journey. I started what I call coach school at Coaches Training Institute (CTI) to become a co-active coach. This included five three day weekends where I learned and practiced techniques in a safe space. As I type this, I finished the final course and am heading towards certification. A coaches most powerful tool is his/her intuition, that gut feeling that guides the coaching. I’ve always felt my intuition and knew from a young age that it held great power. Yet, early on in class, I let fear of being wrong or judged hold me back. As I practiced and grew, I saw that when I trusted myself and trusted my intuition, it was powerful beyond measure and resonated with others. So what if you’re not in coach school? Why might your intuition be useful? Well, for starters, who knows you better than you?! No one is more equipped to understand you needs, wants, hopes and dreams better than your inner voice. You might call it something different – inner goodness or Winston Churchill. You name him/her/it and talk to them often. Listen to what he/she/it is saying and sense the response. At first, you might need a quieter place to do this. After some practice, it will become natural and you’ll have a track record of success. 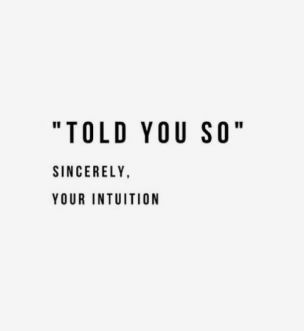 And what if you don’t listen to your gut because sometimes you won’t. Each day is a new beginning, you still have a powerful intuitive sense that you can further cultivate. Find others who you trust and ask them to tell you a story. Listen with all of your intention, ask follow up questions and try to name emotions that might have come up for the storyteller. That’s one way to build your intuition muscle. You know the phrase: Don’t talk about religion or politics are the dinner table. Well, I enjoy challenging rules and this technically isn’t 1) a dinner table or 2) a post solely about religion. I’m sure most of us have experienced how the word religion and the word church can be triggers for people. I know when I say I’m Catholic and attend Mass regularly, I get a range of interesting reactions. Shock, amazement, admiration and disgust are a few I’ve seen on people’s faces recently. It’s a personal topic for sure, but if we don’t talk to each other about it, how will we really know what we each believe? I’d argue that organized religion is one form of church. In the last three years or so, I’ve reconnected with my Catholic faith. The catalyst for this was my sister’s Confirmation as I was her sponsor. I’m grateful that opportunity arose so I could examine my belief system. Yes, I go to church most Sundays, I don’t eat meat on Fridays during Lent and I get ashes on Ash Wednesday. Does it mean I believe everything the Catholic Church preaches? Nope, not one bit. One size does not fit all when it comes to church. I got to Mass on Sundays as a form of meditation and to express gratitude for the beautiful life I’ve been given. It’s not the only form of church I participate in. Listening to Jen Hatmaker earlier in the Fall and similarly, listening to Michelle Obama last night, I felt connected to something bigger than myself. That, to me, is going to church. It’s about connecting to a higher power and having your faith restored in some capacity. Faith, hope, love and peace are somewhat abstract concepts. Yet, when I go to church, whichever kind it is, I can feel and even embody those words. I am repented, I am renewed and I am ready. It’s a part of my spiritual well-being that must be replenished so I can show up each day at 100%. It also helps to build my resilience muscle so when things do go wrong, I have a place where I can draw strength from. It’s powerful and necessary in my life. No one should tell you what or who to believe in. AND there is something powerful and almost magically about faith. It gets you through the toughest situations and brings peace. Faith, much like church, can be found anywhere within anyone at anytime. You just need to be paying attention and open to receiving it as a gift. Regardless of how you were raised, I encourage you to pause and reflect on your spiritual well-being. How do you renew in that space? What does going to church look like to you? It only matters what you think and where you find faith, hope, love and peace. Remember, there’s no right answer and it can be a combination of places, people or things.